One of my favorite ways to change up a drink is simply to switch the vermouth used. Like a martini with dry vermouth? I bet it willl be great with Lillet blanc! Can’t decide between a martini and a martinez? Make a perfect martini with equal parts of each! Another favorite drink of mine is the Negroni, with equal parts London dry gin, Campari, and sweet vermouth. This is a great base to experiment with, as I have show several times here at Two at the Most. One of my most successful substitutions so far was the Rumgroni, simply using rum instead of gin. Last time I was in the mood for a Rumgroni, my eye was caught by my bottle of Amaro Ramazzotti. I’ve covered Ramazzotti several times, because it’s a fantastic amaro. I decided to give it a whirl in place of the Campari. While the initial taste was great, to my surprise going full equal parts on the Ramazzotti seemed to make it too dominant — surprising to me since I think of it as much more mild than Campari. 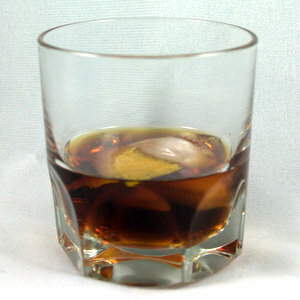 Stir over ice until well chilled and strain into rocks glass with one piece of ice. Garnish with flamed orange peel. Dialing the Ramazzotti back to 3/4 ounce and adding a flamed orange twist garnish made for a great balance. This is another drink that will go into rotation in my home bar. Full and rich, yet easy to sip, and made all the better because of the sweet vermouth. I decided to call it the Visconti after the House of Visconti, long time rulers of the Duchy of Milan. Since it’s a take on the Negroni, named after another duke, it seemed apt. Thanks, Vidiot, for a great topic. Be sure to check out Cocktailians for the wrap-up! Please tell me you already know to keep your open vermouth in the fridge to make it last longer! Yes you are so right, Ramazotti does easily gets too dominant contrary to Campari which actually doesn´t.I believe it has to do with that even though Campari is strongly flavoured at the same time its light while Ramazotti is heavy.